Because of its location near the Canadian border, the Champlain area is an ideal spot for manufacturers and businesses to locate. To capitalize on the region’s economic potential, major water system upgrades are being made. Incorporated in 1873, the Village of Champlain is located in the north-central part of the Town of Champlain. Each has its own governing body. 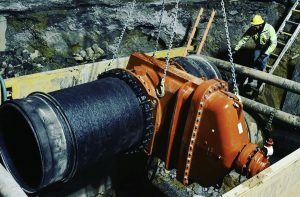 To capitalize on the region’s economic potential and make more land available for new businesses, the Town and Village of Champlain are working together on the Shared Water Project, a major water system upgrade that includes installing 44,000 feet of AMERICAN ductile iron pipe (25,000 feet of 12-inch diameter, 12,000 feet of 10-inch diameter and 7,000 feet of smaller diameter), 70 AMERICAN Flow Control 5 ¼” Waterous Pacer fire hydrants and 375 AMERICAN Series 2500 resilient wedge gate valves. The Shared Water Project includes two new water towers that will increase water pressure and the ability to move water throughout the whole water district. Fire protection capabilities will also be enhanced. A new water treatment plant will feature a Nano filtration system that removes minerals and softens water without the use of salt. The water treatment plant bids have been awarded, and Martin expects work to begin on it in the spring of 2017. 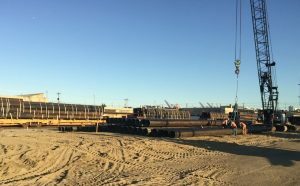 In the town, pipe installation will require blasting due to large concentrations of rock and nine bores under various obstructions, including two under an interstate highway leading into Canada. Michael Jolicoeur, superintendent of Public Works for the Village of Champlain, says the system’s daily usage could increase by as much as 50 percent after the project’s completion. “We’re gaining quite a bit of piping we didn’t have before because of new users,” he said. 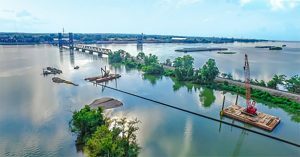 Total project costs are $13.9 million, but a $2-million grant will be subtracted from the cost at the end of the project, effectively leaving $11.9 million to be repaid to the New York state lending agency, the Environmental Facilities Corporation. The village of Champlain will repay 25 percent of the balance and the town of Champlain 75 percent, based on the benefit ratio, Martin said.